Regina had over 15 years' experience consulting and managing technical writing and documentation projects for large corporations before transitioning to marketing. In her role today as Director of Marketing at Aditya Birla Minacs, she continually takes on an ever-growing mandate to support business development while driving new initiatives in social media, analyst relations, and public relations. 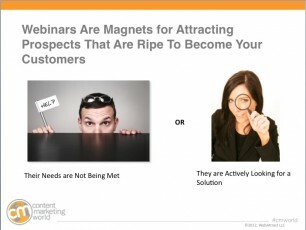 WebAttract’s webinar expert Mike Agron opened his Content Marketing World workshop — Webinar Demand Creation for Content Marketers: From Start to Finish — by stating, “Webinars make content marketing come to life in a way that other forms of content marketing don’t.” Today, both small and large brands are relying on webinars as a key part of their content marketing. In this workshop, Mike led the participants through the execution of a webinar from start to finish.